What day is it again? I went on a whirlwind trip to California this week. I flew west to sunny Sacramento on Monday afternoon and stepped back into heavy, humid Kansas City air on Wednesday night. In between those flights, I learned all about almonds (we even toured an almond orchard! ), caught up with Erin, met some awesome dietitians and drank plenty of California wine, of course. I’ll tell you more about it later! 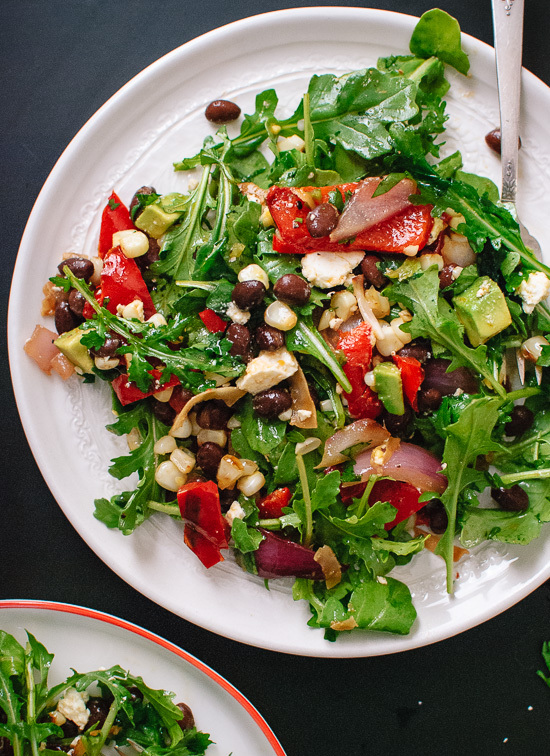 This sweet-and-spicy salad features peppery arugula, black beans, grilled peppers, corn and red onions, avocado and feta, tossed in homemade chili-lime dressing. The coconut bacon is a lovely accent here, but if you’re still skeptical or just plain in a hurry, feel free to substitute crispy tortilla strips or some crumbled tortilla chips. It’ll be fantastic either way! This salad was one of my first forays into grilling. Granted, I’m no grill master, but then again, grilling isn’t exactly rocket science. It’s more like, primitive science. Caveman-level stuff. I made do with my modern electric grill/griddle, which worked just fine! For those without grills, you can roast the vegetables in a 425 degree Fahrenheit oven, turning occasionally, until they’re slightly charred on the edges. I hope this salad fits into your Labor Day plans! 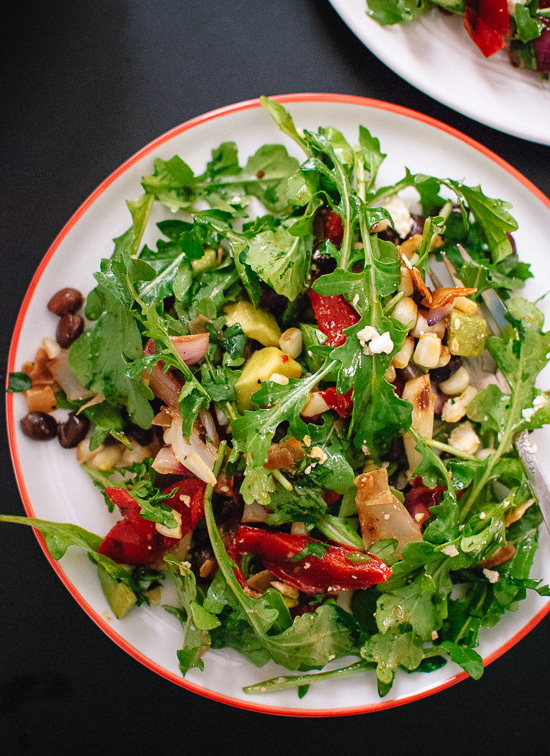 This sweet and spicy salad features grilled corn, bell peppers and red onions, arugula, feta, black beans and avocado! It can serve as a main dish (yields enough for 4 servings) or side salad (yields about 8 side salads). First, preheat your grill (if you’re using an electric grill, heat to 400 degrees Fahrenheit). Toss the prepared bell pepper, corn and onion with enough olive oil to lightly coat all surfaces (I used about 1 teaspoon). Sprinkle with salt and pepper. Grill the vegetables, turning occasionally, until they have grill marks and the peppers and onions have softened a bit. 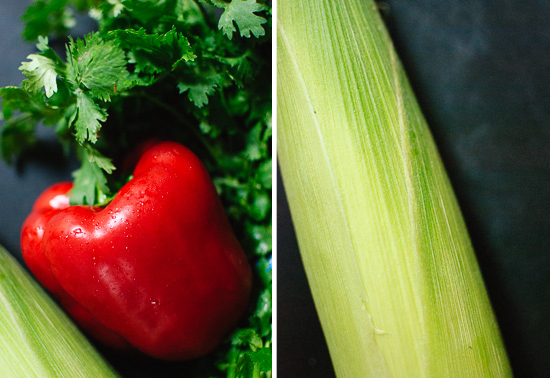 You might find that the corn takes longer than the pepper and onions. Transfer the cooked vegetables to a cutting board to cool. While the vegetables are on the grill, whisk together all of the dressing ingredients until emulsified. Taste and adjust seasoning (more spice, honey or salt) if desired. Roughly chopped the bell peppers and onions. Slice the kernels from the cob. In a large serving bowl, combine the greens, bell pepper, onion, corn, drained beans, cilantro, avocado, feta and coconut bacon (if using). Drizzle on enough dressing to lightly coat the greens when tossed (you’ll probably end up with extra). Toss, add salt and pepper to taste, and serve (if you’re adding tortilla strips or chips, add them as garnishes just before serving). Change it up: I’m pretty sure a bunch of kale would be a fantastic substitute for the arugula. Prepare the kale like I did for this salad (remove ribs/chop/massage). Bonus: kale salad leftovers usually keep well for a couple of days. Make it vegan/dairy free: Skip the feta. Definitely add some salty, crispy tortillas to make up for the saltiness of the feta. Make it soy free: Skip the coconut bacon in lieu of tortilla strips. Storage suggestions: Everything but the arugula and avocado keeps well for a few days. 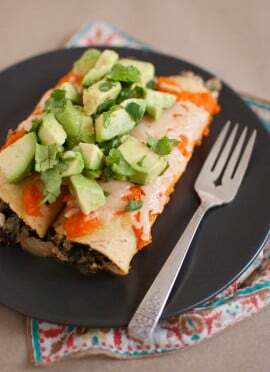 If you know you’ll be eating leftovers, store the greens and avocados separately and toss just before serving. 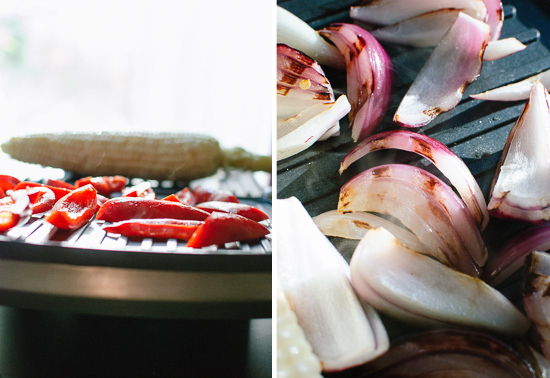 Prepare in advance: If you’re already firing up the grill for another recipe, you might as well throw on extra peppers, onions and corn for tomorrow dinner’s salad. 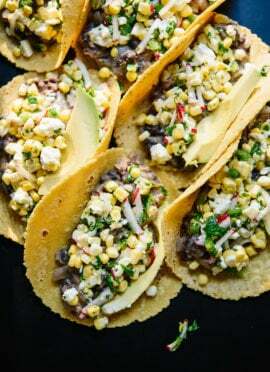 If you love this recipe: You’ll also love my feta fiesta kale salad, summer squash and corn tacos with avocado chimichurri, sweet corn salad wraps and heirloom BLT salad (more appropriately titled CBKHT salad: coconut bacon, kale and heirloom tomato!). Looks delicious Kate! I’ve been making grilled salads this week too! So so good! 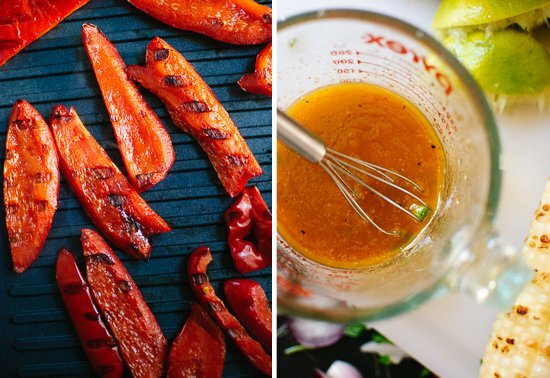 I love the chili-lime dressing you made here! I went to an almond orchard once when I was living in Cali. Pretty cool! Thanks, Liz! I just used the chili-lime dressing on an improvised salad for lunch. It’s my new fave. The almond orchard tour was really neat! I hope to share pictures of the almond harvesting process soon. B-E-A-Utiful! Seriously, so summery and gorgeous. Love it! Looks amazing Kate! I love the gorgeous colours! ps. can’t stop looking through your site, so gorgeous! Oh yum! I bet this would be delicious with spinach instead of arugula… and I happen to have a huge bunch of spinach in my fridge! I absolutely love salads with corn. Going to put this on the dinner plan! Good idea, I’m sure you’re right! Hope you love the salad, Maresa! Yum! This looks so super delicious! I love how this salad is so colorful and fresh! The dressing looks fantastic, too – honey and cayenne together sounds like a wonderful combination. I hope you enjoyed all that California wine! This looks like a dish I would eat multiple times a week. So many of my favorite ingredients! This looks so light and delicious! I love the colors. That salad looks wonderful, thanks for the kale suggestion-have most everything on hand. Looking forward to hearing about your CA visit–almond farm tour, I imagine that was interesting. It always is so remarkable driving out in the central valley and seeing miles and miles of perfectly pruned almond trees. Happy Labor Day! Thanks, Barbara! I hope you enjoy the salad. I learned all about almonds this week. It’s quite an industry! I hope to gather my thoughts and share more about my experience within the next couple of weeks. Hope you’re having a lovely holiday weekend! Awesome! I hope you love the salad, Sammi! Mmmmm looks so yummy! We have been grilling lots of veggies this summer, especially peppers! Thanks, Abby! 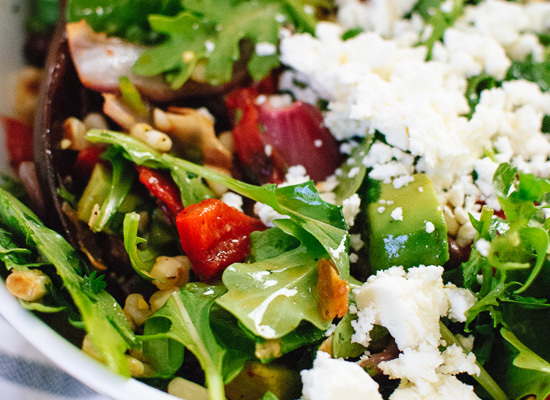 Hope you give this salad a try! Sounds delicious! 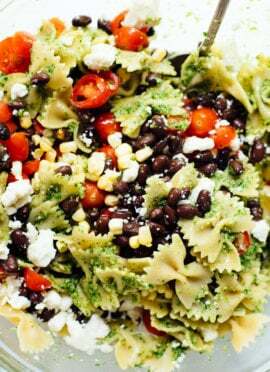 We made lots of dishes similar to this one (veggies+beans+grains, mostly) this past summer. Love! This is the salad I’ve been on the hunt for all summer but have been unable to find at any restaurant… clearly I’ll just have to make it myself! Love!! This looks absolutely AMAZING! I wish your travels to Cali took you a little further south so we could have hung out :) Hope you had a great trip! Oh I wish so, too, Beth! Hope we find an excuse to meet in real life soon! Your trip sounds great; I can’t wait to hear more about it! This salad is exactly what I have been craving lately. Beautiful cobs of corn have started making their way to our farmer’s markets and I love the taste of the charred sweet kernels. We might not be having Labor Day here until October, but this will certainly feature on my menu very soon. Thanks Kate! Thank you, Amy! Hope you enjoy this salad soon! Sounds fun! This salad looks beautiful! cannot wait to hear more about your almond trip! It sounds amazing. I am so going to miss salads like this when summer is over. Simple, but perfect. The more uses for coconut bacon, the better! This salad is great for any time of year! What a tasty looking salad!! I need a plate!! I never get tired of salads like this. I could eat them every day. The coconut bacon sounds really interesting. The grilled peppers would make this salad for me! 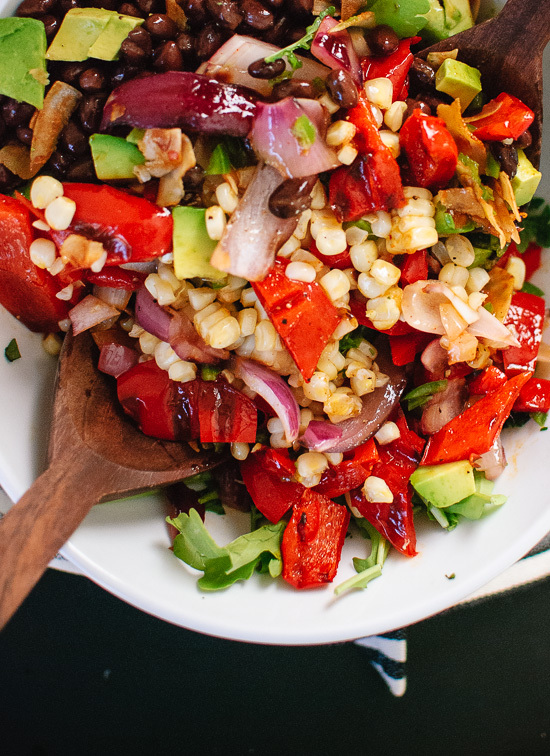 Glory be to this grilled summer salad! And coconut bacon? Heavens! I’m on it! This looks so vibrant! I’ve been on a kale kick lately (as in “give us this day, our daily kale”) so I’m anxious to try it! BTW – I know a lot of people are fondling and massaging their kale for salads. Am I missing something? I just remove the ribs, ball it up in a tight bunch and make very thin slices with my Santoku. Does the massage do something to the kale aside from giving it that post-coital glow? Hey Lisa, sorry for the slow response! Yes, you should be massaging your kale salads! It seems weird at first, but it helps make the kale more palatable (in other words, less poky) and also brings out some more flavor and fragrance. After you’ve sliced it, sprinkle your kale with a dash of salt and scrunch up handfuls of kale at a time. Repeat until the kale is darker in color and smells nice (it doesn’t require much massaging). This is the second recipe I’ve tried from your blog which I found after bad results every time I’d make vegetarian recipes from another site. Both turned out wonderfully (he other recipe was the Cauliflower Lentil Chipotle Tacos-amazing)! I don’t have a grill (my complex won’t allow them-shame!) but I found that roasting the veggies in the oven worked just fine. I’m relieved to have more vegetarian options and appreciate your creativity in cooking as it mixes up our tiring menu! Can’t wait to try this recipe! I’m always trying to find new ways to make eating salads more fun for my husband and I.
Divine, everything works perfectly together. I also added some roasted mini courgette and broccolini. I will be making again. Thanks, Ali! That sounds delicious and veggie-filled. This is my favorite salad! So good, thanks for the recipe.